Following the protests in Tiananmen Square, Moran, Boyang and Ruyu are involved in a mysterious poisoning which alters each of their lives irrevocably. In the present, Boyang has been caring for Shaoai who has been dying a slow and miserable death since the incident. Both Moran and Ruyu have lives in the US, though the events of that fateful afternoon still leave their mark. Li's novel is an exploration of character and while the idea of a poisoning sounds rather dramatic and compelling, in this context it fails to deliver much of a punch. This is partly due to the subdued style of her prose. The book feels quiet and slow paced. While I was hoping for something which might have greater scope in terms of exploring the fall out of the Tiananmen Square protests on ordinary citizens, this remains sadly underdeveloped. Moran is the most sympathetic character, and the one I enjoyed reading about the most; here is a character damaged by the trauma of events in her childhood, and frightened of human connection as a result. Despite this, we see evidence of her inability to stop caring through her relationship with Josef. Ruyu however, is extremely difficult to empathise with on any level. I understand that this is how she is supposed to be, though it's hard to feel anything (including hatred or disapproval) for a character who does not appear to have any motivation for her actions. 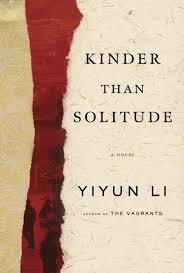 There are positive things about the novel; Li captures that quiet nostalgia for a long forgotten childhood in the descriptions of the past. The scenes that play out between Shaoai and Ruyu are tense and compelling. While Shaoai could be considered victim, she is not especially likeable and asserts herself in ways which are disturbing; this adds a greater complexity and nuance to her ultimate death. Kinder Than Solitude is an interesting exploration of character, but the slow pace may not be to everyone's liking.